Garage World custom design and build large, high quality industrial and commercial sheds for every purpose. Whether you need walls, large open space or a split mezzanine level, no job is too big for our experienced steel building professionals. Garage World also have a range of durable commercial kit sheds in a variety of colours and span widths that can be cut and transported to your site for erection within weeks of order. Garage World provide a full service commercial shed design and building solution from concept to permits, approvals and lock up to ensure you receive on-time completion and a new commercial shed, workshop, or industrial steel building that we will both be proud of. 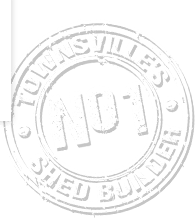 Good looking and economical, our Australian made commercial sheds, factories and industrial metal buildings meet Australian building standards and like all Garage World Townsville products, are built strong and built right with premium quality materials to last the test of time. When you build with Garage World Townsville you have assurance and peace of mind that only comes from dealing with qualified building professionals committed to delivering high quality workmanship and service.